Robert Brown, originator of Brownian movement and the cell nucleus, in research by Brian J Ford. PLEASE ALLOW THIS ANIMATED SEQUENCE TIME TO LOAD. This film is taken from the video recording showing the Brownian Movement of fat droplets in milk, seen through Brown's own microscope. 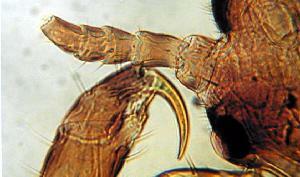 This is how a flea looked to the early microscopists who used compound microscopes. The image is striking, but it is hard to discern fine detail. 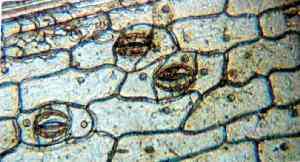 The lenses in the system magnified aberrations, as much as the object. The simple (=single-lensed) microscope produces far clearer images than you might expect. 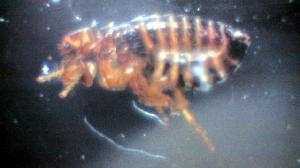 This detailed view of the head and forelimb of a head louse shows finer detail than the view of the flea produced by the compound microscope. Robert Brown's microscope was presented to the Linnean Society in 1928, and examined by experts. They concluded that he could not have seen what he claimed through such a simple instrument. See also: site on current bibliography on Robert Brown and paper on Brown's microscopical experiments.